The Coolidges arrive at the Homestead in Plymouth Notch, following Calvin Jr’s death. Courtesy of the Leslie Jones Collection. Our generation is no different from any other to perceive what it has known is not only fading away but perhaps doing so permanently. What is unique is the degree to which what were once indisputable essentials have now become the ground zero of cultural conflict. No one questioned the self-evident because they lacked modern sophistication or an open, inquisitive mind. They were not cowed by some dread of challenging the way things were as imposed on them by environment or authority. They simply knew better, they understood there were certain truths that are not defined by society but are eternal as the soul, whether they believed God had so ordered the world and humanity’s unique place in it or not. Their disbelief did not overturn so common sense a reality. Generations have come and gone which mocked that reality and held it to be an illusion. Needless to say, they have not discovered anything truer or more enduring beyond the supposed smoke and veil of what others knew to be real all along. In fact, history is piled high with the bodies of those who espoused a naive faith in humanity to conceive its own realities or become its own source of transcendent standards. The highest flights of postmodernist fancy still plummet to the horrors of the guillotine or tragic tales of individual self-destruction by those who feel they can abandon oppressive reality without suffering real consequences. He was simply restating the biblical truth that a child lives longer when he or she honors one’s parents. Coolidge knew the way a person lived did not always catch up to him or her right away. He knew sometimes justice could be deferred but what was due was coming nonetheless. God’s judgment did not sleep forever. Then Governor Coolidge with Grace and their boys: Calvin Jr (left) and John (right), the oldest, fall 1919. Courtesy of the Leslie Jones Collection. Coolidge would likely not have imagined the degree a generation like ours would attempt to go to suspend reality. Yet, having enthusiastically courted it without any substantial skepticism, America’s brazen overconfidence in it is only exceeded by its rapid descent because of it. When Coolidge noted to a friend in the fall of 1932, that he felt he “no longer fit in with these times,” he was speaking of a public sentiment that gave what he believed lip service but no longer believed it and had, in fact, abandoned his principles for spending with impunity, prosperity as a right, and a pursuit of the shiny lure of autocratic, big government Republicanism. Before FDR, the policy forbears of the New Deal were not Democrats, they were the exuberant planners and power-awed courtiers of Hoover’s Grand Old Party. These were not the ways Coolidge had learned from his father. They were not just environmental reflexes either but proven testaments of sound living. Cal did not have to experiment with alternatives to know their flaws and failings, he already knew because of what his father had taught in the daily, practical responsibilities of managing store, collecting local taxes, confronting bail jumpers, and upholding the responsibilities of farm, family, and faith. These were not warm and rosy constructions but sober and stern realities. The President’s father meeting with two Plymouth townspeople, as he continued to serve for the betterment of his neighbors in a range of menial and unassuming ways even with his son’s national notoriety. Courtesy of the Leslie Jones Collection. When Coolidge reflected on some of the lessons learned from his father, he thought of his father’s competence at every task. There seemed to be nothing the diligent older man could not do with skill and lasting quality. Though the father was much more patient than the son, the older man abhorred waste and was firm in his resistance to it. The father was not indulgent but made clear to keep his son humble, a lesson Calvin learned well and perhaps inflicted it too harshly on his boys. One wishes he had not been quite so hard on his oldest son after young Calvin’s death. Young John needed his father’s tenderness and kindness not his distance or constraints. He did not understand how to handle anyone other than himself, including the son most like Grace and Grace herself. He knew Grace and loved her devotedly but his focus did not allow him to step out further as the kind of father each boy needed. The older Calvin retained well what he would call “the barnyard philosophy of his father” not as a derisive concept but as the wholesome dose of sense that people should not seek to light like chickens higher than they could roost. Instead, each should live with the fullest independence which meant living within one’s means, not upon borrowed time or borrowed resources. My fundamental idea of both private and public business came first from my father…He was generous and charitable man, but he regarded waste as a moral wrong. Wealth comes from industry and from the hard experience of human toil. To dissipate it in waste and extravagance is disloyalty to humanity. This is by no means a doctrine of parsimony. Both men and nations should live in accordance with their means and devote their substance not only to productive industry, but to the creation of the various forms of beauty and the pursuit of culture which give adornments to the art of life. Colonel Coolidge (far left) beside the President with Henry Ford and Thomas Edison with one of Cal’s signed maple sap buckets, August 1924. Courtesy of the Leslie Jones Collection. Coolidge was not finished, as he explained how this practical lesson changed the course of millions of lives as a defining accomplishment of his administration years later. By possessing the will, not merely the rhetoric, to hold government to an exact standard, actually removing expenditures, dismantling the crushing regulatory tax burden and paying down debt obligations, Coolidge proved that the interests of the whole country (or any business in particular) needs the competent not the novice at the helm. 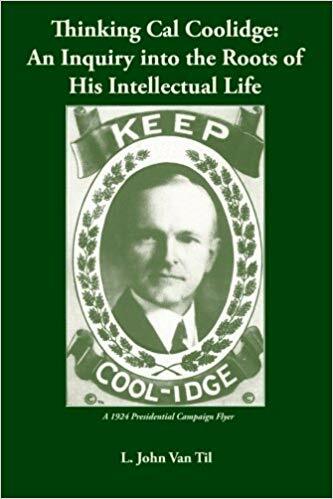 Coolidge would have been the last person to ever take credit for the labor and discipline of those millions of people helped by his tenaciously kept program of constructive economy. He simply enabled them to do for themselves, keeping more of what they had earned. Government’s greatest aid is not in appropriating money but in restoring the powers of ownership and opportunity. He understood that virtue was no more unique to businessmen than to any other field of service, including politics. One’s fitness for public trust was not found in the appearance of being on the outside, let alone one’s cultural name recognition, but the character of the person and the fidelity to the responsibilities one has already shown. It was human nature to seek power, access, and others’ money. It was the President’s challenge to protect the whole people from those who would try to take advantage along any of these routes. He understood that trustworthiness was at the heart of all service whether that was public office or private business. In this way, he knew business better than most do today. He learned this by first drawing upon the insights of his father. The father understood his charge as a patient teacher of human nature and a watchman of his children’s souls. It is likewise unfortunate that while Calvin mastered a superb ability to detect charlatans and schemers, he exasperated his children with a marked favoritism for the younger and an unnecessary measure of severity on the elder. If Coolidge is to be faulted, it must also be remembered this was because he first poured himself into the oath he had taken and the public duty he owed that, in the end, left him with less to give as a father or husband. He spent himself in doing his work so faithfully each day that his family suffered the most for it. He felt it most sharply when he remembered both his younger son’s death and then that of his father’s, writing on one occasion, “It costs a great deal to be President.” Both he and his father put their youngest children in the frozen ground of the family plot. It is regrettable that the President responded so differently from his father when it came to grief. Yet, death impressed itself early on the son’s life in ways we dare not nor can quantify. It still did not override or paralyze Calvin’s sense of obligation to finish what he started as President. Both Colonel and President Coolidge, in spite of their shortcomings, were exemplary leaders of men, though it is in the father we find to a greater degree that most essential of qualities: first managing one’s house well. It is almost a proverb that those who serve in public ways often find their own house neglected in some substantial fashion. For Calvin Coolidge, who understood this in perhaps a morbid way by modern terms, he paid a penalty for his pride through these deaths on either side of him. The lessons of his father were never far away. While both men were kind and manifested a heartfelt love for people, the father was more adept at showing it while it remained an awkward skill in the hands of the son. While Calvin had to work harder to show it, he felt it no less acutely for all people. He especially manifested it when someone was treated unfairly, at times descending on the offender with a fervid indignation to correct the wrong done. The White House staff was on the receiving end of this withering fury more than once. He hated liars and abhorred those who would distort integrity and manipulate for personal advantage. He had already seen his predecessor undone by indulgent habits, Calvin would not abide it in his tenure. He detested those who vaunted themselves above others. He was the best prepared leader when the times most needed someone of his mettle and focus. His intensity for the public service was genuine and unmatched. He spent himself so fully in the five and a half years of his administration that upon watching it be swept away in one large swath after another (inside of another four years), he would be gone. Yet, he exemplified some of his father’s most important lessons and he transmits them now to us long after his generation has passed. In a time when it seems politicians are just “warming up” to their roles after two terms, expecting lifelong careers ahead, Coolidge would already have completed his goals, laid down the office and returned as an equal to the people from which he came. Firmly adhering to the ideal of a servant-leader, he took care to uphold the original scope of the office, to mitigate the corrosive effect of power on – first of all – himself, to faithfully execute the laws and the Constitution, and to live worthy of his father’s lessons. He may not have been the best father himself but he and Grace still raised two of the finest boys ever known into exemplary men. The faithful men and great women of the future will not spring from some other set of conditions outside every parents’ solemn task. It will not come by insulating our children for perpetual adolescence. It will still be incumbent on us to raise our boys to know they are to be men someday with sober responsibilities, foremost as husbands and fathers. It is no different from every generation that we are also to bring up our girls to prepare for equally important obligations, aspiring foremost to be as wives and mothers. It rests with us, especially us fathers, to face reality for what it is, to live up to the lessons good men have taught, and to leave what is worth preserving to those who will follow us. 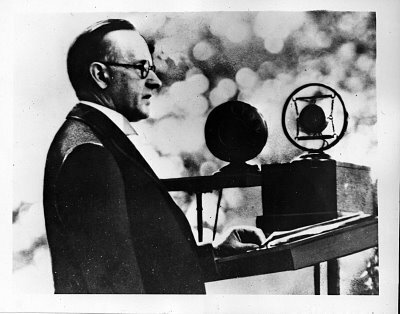 Former President Coolidge’s last public appearance, Madison Square Garden, October 11, 1932. Courtesy of Everett Collection Historical/Alamy Stock Photo.